...so Sara said. | Wittier than Perez – and way better looking. Wittier than Perez – and way better looking. Assuming you will need to update your bookmarks, please note that I have taken the plunge and am moving to Tumblr. They allow me to have my actual URL without paying for it, so there I will be. CLICK HERE and be redirected. I have better news that that, though. Way better. You guys! This is HUGE! This case displays a need for constructing a permanent cure for HIV through genetically-engineered stem cells. While this doesn’t for sure mean that there is a fast-and-steady cure, it is definitely on its way! Anyway, there is a recording of them singing the chipmunks song! Meta. I LOVE your amazingly catchy song “Just a Dream” but I need to tell you… “only just a dream” is the most grammatically annoying/redundant thing I’ve* ever heard. Could there not have been a better 2-syllable word than “only” before “just?” This is almost as offensive as people who say “but yet”. BUH! Sigh. I’ll continue to listen to this for weeks, anyway. It’s too good. *Brit pointed it out first. Gotta give her credit or she’ll yell at me later! Also, I want to be the person whose notebook that was. SHE HAS ALL THE FUN! For more than half the year, Qatar is an oven. Not an Easy-Bake Oven, either. An oven just below the sun that doesn’t need to be powered by gas because the sun is sitting right above it and heating it up. That kind of oven. The average daily high during the summer is 115°F. And absolutely no rain. I’m thirsty just thinking about it. Not to mention global warming. I’m sure by 2022, the average temperature will be more like 125°F. As part of the bid, the Qatar delegation promised to construct nine new stadiums and renovate three others. This will cost approximately $4 billion, but does not include the $50 billion in infrastructure costs the country will undertake in order to handle the crowds that the World Cup will bring – an approximated doubling of their population. The stadiums they are building are going to be air-conditioned open-air buildings. NOT DOMES? Really? REALLY? How is that going to be at all economical? AND: forget about the final trophy, the real prize will be avoiding skin cancer. Qatar officials say their system of roof-top solar thermal panels will get the temperature down to 80°F on the field. Maybe I’m spoiled, but that’s still pretty warm. I don’t know. I’m torn. It’s great that the Middle East is going to get a bunch of new tourism, but why wouldn’t Dubai have gone for it? Qatar is still developing. Sure, this will give them incentive to develop faster, but at what cost? Well, $50 billion, I guess! What do you think? Should one of the other bidding countries (USA, Australia, South Korea) have gotten the bid, or was this a good choice? Look what happens when your star (only) player goes off to the NFL! Your head coach quits! What? That’s right: Urban Meyer has stepped down as the Gators head coach. It just so happens that Tim Tebow is coachless over in Denver. Is this a coincidence? Probably not. See you in Colorado, Meyer. I can already feel Tebow’s Jesus eyes crying. It’s misty and sad. Also: I’m blogging about sports. WHAT has happened?! Who is the copywriter for this ad? I want to slap you. I also want to slap your copy editor. 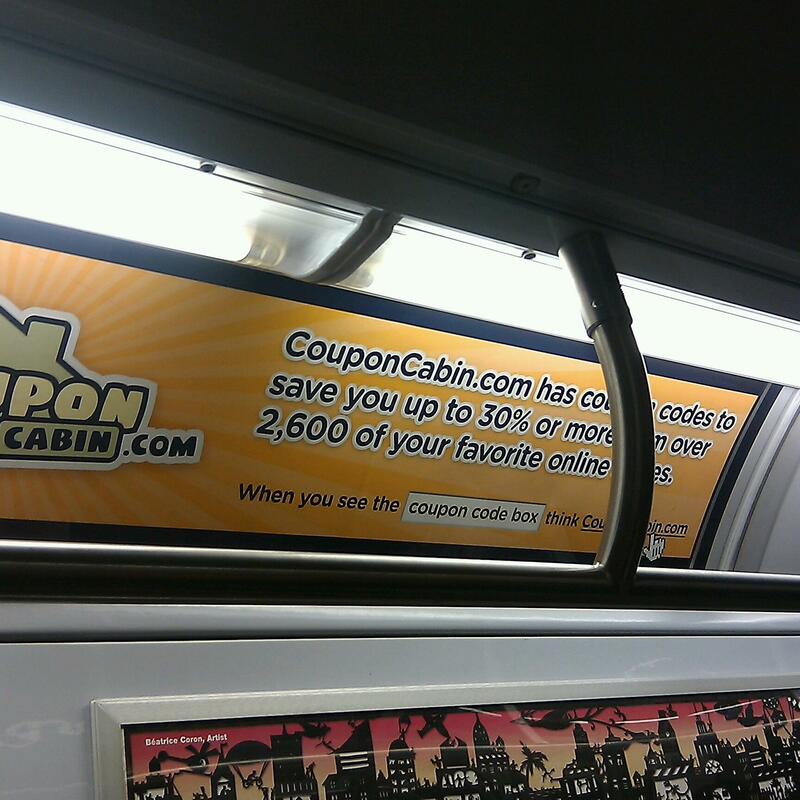 And the people who commissioned this ad to be on the train this morning. YOU CANNOT HAVE BOTH “up to” and “or more”! Cannot! You can either have “up to” 30% or “more than” 30%. Ugh. the google ebookstore – i’m in it! Juuuust in case you are one of the unlucky ones who has yet to purchase and read my short story entitled “4 Stories Down, 4 Stories Up,” you are in luck! For today I have been notified that you can purchase it at a discounted rate in the GOOGLE eBOOKSTORE!